The Beogram 5005 was the first model in the series that would be the last new Beogram design. In both technology and appearance it was basically the same as the Beogram 7000 that was deleted from the range nine years later. 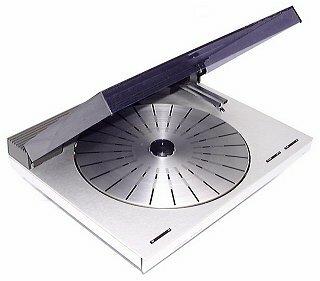 This series of compact tangential tracking turntables would become very popular, and would eventually encompass 12 separate models. When launched, it fitted into the range between the various derivatives of the Beogram 1800 and the top-line Beogram 8002. Text copyright © Beocentral. Unauthorised reproduction prohibited. The Beogram 5005 was introduced as a replacement for the Beogram 5000. The main change was of course the use of tangential tracking, a desirable feature in the Beosystem 5000 for which it was intended as it enabled the arm to be moved easily by remote control. The keys and software to do this already existed within the Beomaster 5000/Master Control Panel 5000 as this function also worked with other, earlier models, such as the Beogram 8002. In keeping with other Beosystem 5000 components, the Beogram 5005 used the same cabinet style, size, colours and finishes as the Beomaster, allowing for many visually pleasing placement options. The only slight discontinuities were that the lid “open” function, and thus the front panel legend, had been removed as the lid now was on a simple counterbalance spring and had no release catch, and that the orange “standby” dot had been removed because the new software removed the “standby” Datalink function from the machine. This was a great improvement as it was now possible to stop and change the record mid-way during play without using the remote control or switching the system off, something that had not been possible with the Beogram 5000. The Beogram 5005 lacked the elegant light that had been fitted inside the lid of the Beogram 5000, but instead had a tiny spotlight at the back that was focused on the pickup area. This was switched on automatically when the arm was under manual control, though was in practice too dim and at too shallow an angle to be of any real use. Text copyright © Beocentral. Unauthorised reproduction prohibited. The Beogram 5005 carried forward all the important styling cues from previous tangential-tracking Beograms. The simplified nature of the construction rendered the important ones redundant however, reducing what had been engineering necessities to simple decoration. For example, the radial bars on the platter, which had previously been used in other models for record size detection, now served no purpose as record sizing was done by weight, as it had been in the Beogram 5000. This also meant the second arm was also not needed, but it remained all the same, and served only to carry a speed indicator light. Because the second arm now had no record detection function, it was moved to the right of the tonearm proper. Inside, it also appeared that the designers had lowered their standards somewhat compared to previous tangential tracking Beograms like the 4000 and 8000. For example, the Beogram 8000’s “tangential drive” direct-drive motor was not fitted, instead a simple belt drive arrangement and DC servo motor, as had first been seen in the Beogram 1902, was used. The precision lead-screw that had previously been used to move the arm in the other models had gone too, to be replaced with a cord-drive setup using plastic pulleys and nylon-covered steel wire. Many of the working parts were now moulded plastic, and the tracking motor was no longer a precision ironless-core servo type but a far simpler, cheaper design of a very similar construction to the one that was used in the Beocord 5000 to drive the tray in and out. The designers had even arranged to use gears driven from the turntable shaft to drive some of the mechanical functions, something not normally associated with top-quality models, though this did allow some mechanical functions, such as the returning of the arm to its rest position after the end of the record, to work far more quickly than had been the case with the previous tangential tracking models. Text copyright © Beocentral. Unauthorised reproduction prohibited. The Beogram 5005 finished the Beosystem 5000 off nicely, making multi-room operation of the turntable a practical possibility. As often happened with B&O, what had been a mid-range model would, in later forms, graduate to the top of the range as the more complex and expensive models above it were discontinued. The Beogram 5005 was replaced by the almost identical Beogram 5500. Text copyright © Beocentral. Unauthorised reproduction prohibited.